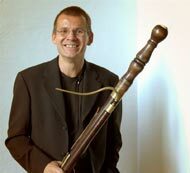 Rainer Johannsen studied recorder in Maastricht and Amsterdam, and historic bassoon with Michael McCraw in Cologne and with Lorenzo Alpert in Geneva. Starting in 1995 until the end of Musica Antiqua Köln in autumn 2006, he was solo bassoonist at this ensemble with Reinhard Goebel. He played in many renowned ensembles and orchestras such as moderntimes 1800, La Petite Bande (Sigiswald Kuijken), Concerto Köln, Amsterdam Baroque Orchestra (Ton Koopman). Rainer Johannsen teaches regularly historical performance practice, bassoon, recorder and chamber music in his master classes at the Free University in Mexico City (UNAM).